Reference 605 represents the Patek Philippe pocket incarnation of the World Time (Heures Universelles) mechanism invented by Louis Cottier. 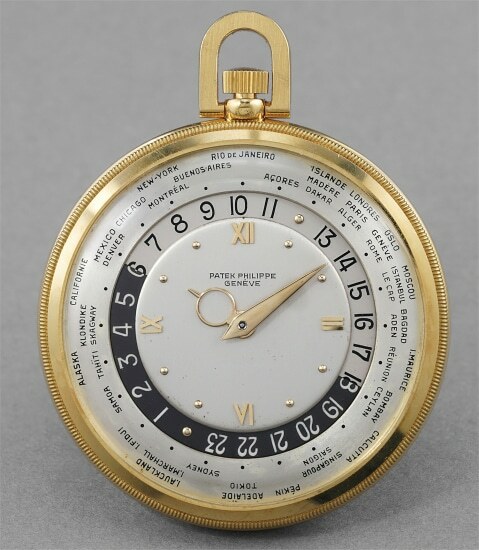 Between 1930 and 1964, Cottier delivered to Patek Philippe 95 modified 17-170 movements (considered one of the best time only movements of its time), most of them employed in ref. 605, rendering this an astoundingly rare model with a total output below 100 pieces. The present example impresses with its incredible condition. Obviously unpolished and hardly ever used, the timepiece appears to be in near mint condition in all of its parts, to the point that it can be considered a “scholarly” piece which allows the beholder to admire the original proportions of the case and details of the dial in absolutely unmarred state. A final layer of appeal is given to the watch by its "short signature". Patek Philippe changed their signature from "Patek Philippe & co." to "Patek Philippe" in 1948, the year of production of this timepiece. Then, it is one of the first Patek Philippe watches to feature the short signature.